This past weekend, I attended a gala reception for over 500 European Harvard alumni gathered in the impressively refurbished main hall of the Deutsches Historisches Museum (German Historical Museum) in Berlin. Harvard's President Drew Faust regaled alumni with self-congratulatory statistics on how Harvard is spending the fruits of its current $6.5 billion fund raising campaign, refurbishing undergraduate housing and getting Harvard' science and engineering departments up to snuff. There was other news from Cambridge, Massachusetts that President Faust ignored in her polished plea to well-heeled alumni in Berlin. 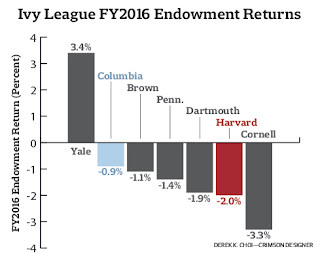 And that has been the embarrassing performance of the Harvard endowment over the past decade. Harvard's 'Lazy, Fat, Stupid' Endowment? 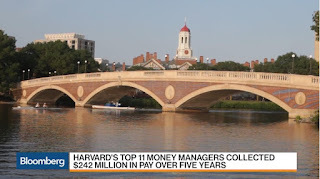 Harvard University’s money managers collected tens of millions in bonuses by exceeding “easy-to-beat” investment goals even as the college’s endowment languished, employees complained in an internal review. The consulting firm McKinsey & Co., in a wide-ranging examination, zeroed in on the endowment’s benchmarks, or investment targets. Some of those surveyed said Harvard allowed a kind of grade inflation when it came to evaluating its money managers. “This is the only place I’ve seen where people can negotiate the benchmark they get compensated on,” read a “representative quote" in the McKinsey report. Liberals Attack on Public Pensions? The Liberal government is following the Conservatives’ lead by introducing legislation that will allow employers to reduce pension benefits. This bill will allow employers to shift from good, defined benefit plans that provide secure and predictable pension benefits, into the much less secure form of target benefits. 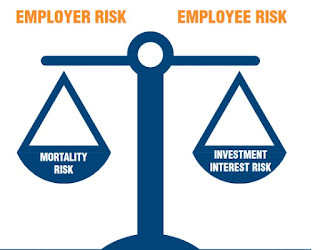 Unlike a defined benefit plan, where the employer and employees contribute and retirees know how much they can expect when they retire, the amount you receive under a target benefit pension plan is just that, a target. Meaning, the plan aims to give you a certain pension benefit, but there’s no guarantee. The Future of Retirement Plans? Variable benefit plans are a type of defined benefit (DB) plan that have been around for decades, according to Matt Klein, a principal and leader of the actuarial services practice at employee benefits consulting firm Findley Davies in Cleveland. However, few sponsors and retirement plan advisers know about them, he says, estimating that there are fewer than 100 of these types of plans in the United States. Nonetheless, he believes that sponsors and retirement plan advisers might be interested in them since they shift the investment risk off of the sponsor’s shoulders onto the participant’s—while moving the longevity risk over to the sponsor. Canada's New Masters of the Universe? They are among the world’s most famous landlords with stakes in major airports in Europe, luxury retailers in New York and transportation hubs in South America. 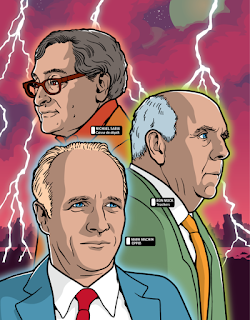 They rank as five of the top 30 global real estate investors, seven of the world’s biggest international infrastructure investors, and were at the table during six of the top 100 leveraged buyouts in corporate history. And they are Canadian. The Elusive Search For Alpha? What's Worrying the Bank of Canada? Norway's GPFG to Crank Up Equity Risk? Fading Risks of Global Deflation? The UK's Draconian Pension Reforms? Quebec Holding Out on Pension Reform? The Malaise of Modern Pensions? Brace For a Violent Shift in Markets? CPPIB Chief to Testify at Parliament? Rhode Island Meets Warren Buffett?